Overall Rating: 10 – pound for pound, this is one of the best deals on the market today. The fifties are often considered the “Golden Age” of science fiction. It was the heyday of the pulps; masters such as Robert Heinlien and Isaac Asimov were hitting their stride; Hardware, be it robots, vehicles or starships, played a prominent role in these movies. 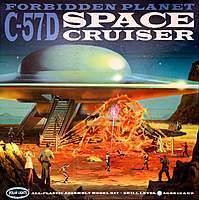 Forbidden Planet brought us two icons: Robbie the Robot and what’s arguably the coolest flying saucer on the big screen, the C-57D Starcruiser. There have been several garage kits of these two subjects over the years, but it took Polar Lights to produce the first mass-market injected kits of either. When the local hobby shop gets this kit in, you’ll know – it’s impossible to miss the huge box hogging all the shelf space! All those folks who like your models BIG will be pleased with this kit. At just under 28″ in diameter when finished, it’s bigger than any of the end tables or nightstands in my house (which begs the question: where the heck am I gonna put this thing when it’s done? I’ll worry about that later, I suppose). One thing’s for sure – you certainly get your money’s worth with all the plastic stuffed into the box. Polar Lights has put a lot of thought and care into the packaging of all 105 parts. The box seems sturdy enough to use as a step stool, a welcome change from the typical flimsy packaging many model companies seem to favor (are your ears burning, Revell? ERTL? Italeri?) Inside, it’s divided into two compartments by another sturdy piece of cardboard. One side holds all twelve hull sections, all securely bound and packed in their own plastic bag. On the other side, another bag holds most of the interior pieces. The two clear domes are protected (mostly) from scratches and abrasions by tissue paper, and a collection of small clear bits has their own separate bag inside the main one as well. Finally, railings and other fragile bits are secured inside another stout cardboard compartment. Admire the way they got everything to fit snugly inside the box – because once you take it all out, it’s virtually certain you won’t get it all back in as neatly. The parts themselves are molded in typical Polar Light’s tan and clear styrene. There is almost no flash on anything I’ve seen, no heavy mold seams and no mismatched parts. Detail is uniform and fairly sharp throughout – crisper than what we saw in the Jupiter 2 (and that wasn’t bad itself). The folks who engineered this obviously spent a lot of time and effort to make things as detailed as possible, without having to resort for “approximations” like the park bench pilot seats found in the J2 kit. About the only negative I can see concerns the hull surfaces. Each has a very definite “texture” (for lack of a better word) – look closely and you can see where the melted styrene was injected, resulting in a series of interlocking, fan-shaped patterns. With parts this big, I don’t see how this could be avoided. This pattern will definitely be highlighted by a coat of silver paint – which could be a problem, or not, depending on your viewpoint. Personally, I think it gives the surface a more “machined” look, but those who want a perfectly smooth exterior will have some work to do with the polishing compounds. Instructions, unfortunately, are typical for Polar Light’s kits. Consisting of a page of general paint notes and two of exploded diagrams, they’re not actively counterproductive, but they’re not overly helpful either. Anyone who has built a kit or two should be able to puzzle out the diagrams, but the text … well, “Assemble the spacecraft interior by following the assembly diagram” is pretty much a waste of ink. The paint guide is somewhat more helpful, though it only provides generic color callouts. No decals are provided. Though they might have been nice to have for the consoles and instrument displays, their omission isn’t a significant downfall in my opinion. OK, John so it’s a nice kit – but is it accurate? Polar Lights reportedly spend a great deal of time poring over the film, frame-by-frame, to recreate the interior (some of which, like the upper deck, was seen briefly if at all). I won’t quibble over how close they may or may not be to perfection inside – it certainly looks close enough from what I see in the film. The only thing that I question is the landing legs. Only one is provided with stairs, and I am almost positive all three had them – though since we see only one hatch, why all three would have stairs for crew to run down after landing is a bit of a mystery. No matter – if it really bugs you, it should be a simple matter to duplicate the one stair part in resin. A preliminary dry-fit of the pieces indicates that assembly should be pretty straightforward, with decent fit. The upper and lower saucer hull halves are each made up of six interlocking pieces. All six of the lower hull pieces have cutouts for the landing legs; only three get those legs, while the others get plugs. All this means there will be significant putty work to get everything smoothed out, but it shouldn’t be too traumatic. Fit really does look decent. Polar Lights has given the modeler the option to show off the interior by providing the upper and lower domes in clear plastic. If you choose to leave these domes clear, you’ll want to polish the pieces and dip them in Future or similar clear acrylic. The plastic is thick, but relatively distortion-free, so all the work you pour into detailing the insides should be visible. Alternatively, you can choose not to glue the domes on, and remove them when you want to see what they cover. (A third option is to leave the domes off entirely, and use the them as cereal bowls. They’re certainly big enough!) The chosen scale of 1/72 means there are all sorts of options available for those who want to take this model to the next level. There are many 1/72 scale figure sets available, for instance, and converting (say) a group of WW2 German Luftwaffe personnel into the ship’s crew should be relatively easy. A scale Anne Francis may be harder to find, but shouldn’t be impossible. There are plenty of aircraft interior sets, in resin and photo-etch, with which to dress up the interior as well. It would have been nice to get a scale tug and several ion cannon, but those are easily scratched (and I think there are gaming miniatures available that are pretty close to being of the correct appearance – at least for the cannon). I’m really looking forward to building this kit. The drawbacks (surface texture, landing legs, instructions) are really minor – especially compared to the “cool factor” of how this should look when done. Built stock, it’ll be an eye catcher. Peopled with a crew of 1/72 figures, perhaps on a diorama base, it’ll be a show-stopper. If you’ve built a couple of kits and have enough patience to tackle a big project like this, then you should have no troubles. Highly recommended! Additional News: Monsters In Motion will be offering a sound & light kit for the Polar Lights C57D. It will retail for Aprox $29.99 and will be available exclusively through MIM. Reference Material: A collection of stills from the movie, covering various parts of the ship, are posted here: http://www.graphiko.com/forbiddenplastic/fp/ref_c57d.html.